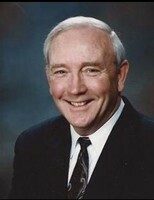 Charles E. Laws, 75 of Moline passed away March 18, 2011 at Manor Care in Davenport. A memorial service will be at 10:30 a.m., Tuesday, March 22nd at Esterdahl Mortuary & Crematory, Ltd., 6601-38th Avenue, Moline. Visitation will be from 4:00-8:00 p.m. on Monday at the funeral home. Private burial will be in Riverside Cemetery, Moline prior to the memorial service. In lieu of flowers, memorials may be made to the QC Animal Welfare in Milan, Black Hawk College Foundation in Moline or Niabi Zoological Society, Coal Valley. Chuck was born on February 4, 1936 in Quincy, IL the son of Leon and Helen Hagen Laws. He married Carol Johnson on March 28, 1959. Chuck was a teacher and coach at Moline High School for 9 years. At Moline, he was the sophomore wrestling coach, and his team went on to become Illinois State Champions. He was employed as a college administrator at Black Hawk College for 30 years. He started at the 16th Street Black Hawk College, and was instrumental in the building and planning of the current Black Hawk College Campus. He later worked as Director of the Quad Cities Graduate Center for 9 years, retiring in 2005. He graduated from Moline High School in 1954. He received a BA Degree from Northwestern University where he was a member of the football team under Coach Ara Parsegian and also was on the wrestling team. While at Northwestern, he was a member of Beta Theta Pi Fraternity. He received a Master of Education Degree from the University of Illinois, and a Doctorate of Education from Southeastern Nova University in Florida. Chuck was a Moline Rotary member, and also on the Illinois Quad City Chamber of Commerce Board of Directors. He was a board member of the Rock Island Arsenal Golf Club, where he enjoyed playing golf. He loved boating with his family on the Rock River and Mississippi River, and also in the Florida Keys where they spent hours snorkeling on the reefs. His greatest joy was doing things with his kids while they were growing up. On the 4th of July, he built a float on their little red wagon for the guinea pig, Boo-Boo, so they could pull it in the parade. His family vacations to Florida and Colorado were very special. The greatest one was in 2007 when he and Carol spent 3 months in New Zealand and Australia. He was so impressed with the scenery and the exotic animals. This was a happy time for him. He especially enjoyed watching his grandchildren and their activities. Chuck was known by all for his sense of humor and the twinkle in his eye. He was preceded in death by his daughter Lisa, his parents and his sister Katherine Groman. Having just posted a comment for Miss Steckel, I looked at the list of other MHS teachers I had. I had Mr. Laws for World History, and I think it was an Honors class, as I recall. One day we had an assignment for an oral report (on something) for the next class and when I ran out of time that night using some obscure, worthless source, my report was on water bodies somewhere, some obscure country. I knew it was a next to useless report especially when Mr Laws later quietly asked me (something like) was that a useful topic and I wholeheartedly agreed it wasn't. I never required oral reports in my own Honors classes in Colorado but when one of my own Honors students wrote a paragraph on Christopher Columbus (his significance in American History) she discussed at length how long all of his ships were, how many people each ship carried. I reminded her that none of that was especially significant information, remembering well Mr. Laws. That student later went on to Harvard .